For those who like their tone and just want more of it. John Mayer, the reprised American guitarist, uses the Keeley Katana Pre Amp Guitar Effect Pedal in his guitar pedalboard, to achieve a very clean sound cut. 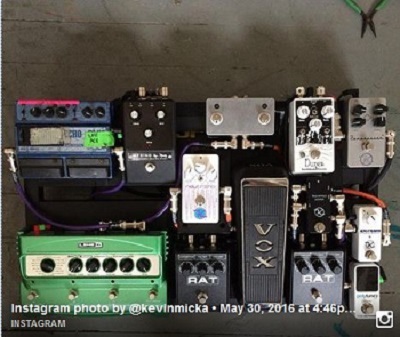 At 7:42 you can see the Katana Pre Amp Pedal in James' pedalboard. In this rig rundown for Premier Guitar, Jónsi's pedal board shows a Keeley Katana Pre Amp Guitar Effect Pedal, visible at around 06:24. Laura uses a Keeley Katana pedal, according to Guitar Geek's [rig diagram](http://www.guitargeek.com/laura-jane-grace-against-me-guitar-rig-and-gear-setup-2011/). I've tried countless clean boosts (BBE, EHX, TC, and MANY boutique brands) and this is by far the best one. Out of everything I tried, this one actually does what it says on the tin. Through the front-end of a tube amp (Marshall) it will actually give a perceivable volume and "presence" boost instead of just adding gain or compression. This is about as transparent as it gets too, and honestly most of the hype that surrounded this pedal when it was introduced is absolutely dead-on. This is the one pedal that I never play without. I used this effects pedal for a long time now good quality recommended. "can i have just more presence on my sound?" put presence without touch your guitar sound with this baby.